Earlier Google has launched File Management App called Files Go only for Beta Users. But Now it is available for all the users. Also, Google has renamed the Google Lite App to “Google Go.” Google Go v1.0 is the lite App which was available earlier as Google Lite v0.5. This app lets you search Google, but it’s tuned for situations where mobile data might not be available consistently or cheaply. You can save pages offline, get notifications when search results are ready, and load “lite” versions of pages. Here are Top 5 Features of Google Go you should know about. This will give you the idea what Google Go can do or why the App is available. And also why should you use the App. These are the question that comes to our mind because there is already a Google App available. So why do we need another Search App? Everything will be cleared in this post regarding Google Go App. Google Go is the lite version of Google App of which you are already aware. It gives the unified Google experience to Internet users on low-end handsets. Like Google App “Google Go” will give you quick access to search, weather, and voice-activated functions. It is a lite App so everything you will get will be in lite like interface. It will boost the browsing performance of your Phone. This will be more helpful if you have limited internet data because it saves the mobile data with lite performance. In order to stay light (at under 5MB per download), Google Go has opted to avoid the heavier Google apps card-based interface, and instead go with buttons that open into separate pages. The interface looks good, and it is highly managed you will like the Interface. Follow the Snapshot to see Google Go Interface. 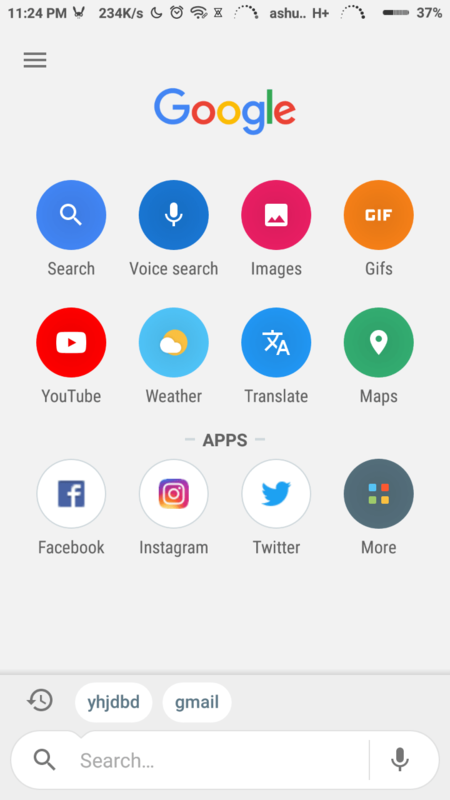 In HomeScreen of the App provides access to Google services such as Search, Voice Search, GIFs, YouTube, Translate, and Maps and includes a search bar to provide a unified experience. App section is managed properly in categories like Games, Social, Sports, News Education and more. Unlike Google App, on Google Go App the google search bar is located below which give a unique experience. No doubt that the App is fast to provide a better browsing experience. It has the advantage of being lite which helps to load a page more faster. Google Go makes discovering, exploring and sharing the best of the web easy and fast. You can get answers quickly and reliably with Google Go, even on slow connections and smartphones with low space. At 5MB in size, it’s speedy to download and get started. The App is launched especially keeping in mind the low-end devices. It works perfectly with the low-end device. It can be used even on a smartphone with 512MB RAM very easily. So if you have a phone with 1GB RAM or less, it could be the best App for browsing. It will enhance your browsing experience. This is the lite App, and it will only take about 12MB of Storage on your smartphone. Read more on Top 5 Features of Google Go. This is the lite App, so the Data saving is also one of the advantages. This is also one of the features to prefer the App over other Apps. Sometimes we face limited Mobile Data problem, in that case, we can use Google Go App. 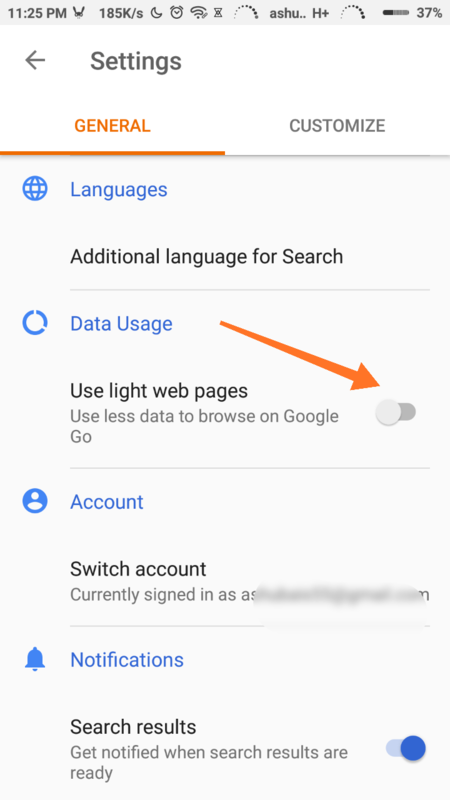 In the Setting section of the App, there is an option for using Light Web Pages. By turning on the option, the browsing will use less data. Using this option you can save some Data for later use. The Google App comes with the feature where you will be notified when the search results are ready. It means when you search and you switch to other App then the App will notify when the search will complete. It also saves the result offline to check it back later. The notification option should be Active in the App Setting. Go to setting in App and then turn on the Search Results under Notification Setting. If you know better features of the Google Go App then lets us know we are happy to add more. You have read Top 5 Features of Google Go. Stay connected to YTECHB for latest Tech News, Android & iOS Tricks, Telecom News, Accessories, Mobile Reviews and much more. Like our page on Facebook, Follow us on Twitter, and Subscribe our channel on YouTube @YTECHB. If you have any questions regarding Top 5 Features of Google Go, ask by using #YTECHB in the comment section.